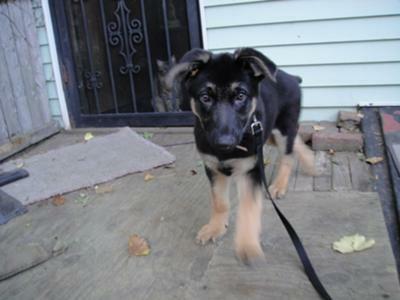 I have a German Shepherd puppy who is almost 3 1/2 months old. He is very bad when I'm walking him. He walks with his head down sniffing for anything that he can find to take in his mouth and probably swallow some of the things. Therefore, walking him is quite a struggle. I try to hold the leash very short so that he won't be able to touch the ground with his mouth. But he is quite big for his age (weighing almost 30 pounds) and he pulls the leash very hard. Also he wants to jump on all the people who are walking by. It is getting harder and harder to try to restrain him with the leash. He doesn't listen to NO either. What should I do to stop this wild behavior. He is such a cute puppy but he is soooooooooooooooooooooo bad. What do you advise me to do? Total German Shepherd: Are you a first time dog owner? Just curious. Your German Shepherd puppy is not being bad when he's sniffing the ground - that's how dogs learn about what's happened there recently - think of it as a doggy "newspaper". And remember - you have a German Shepherd puppy - a baby dog - and that's how your baby is going to learn - by using it's sense of smell. Did you know that the sense of smell is a dog's most predominant sense? It's true! They use smell in much the same way we use sight - it's just that important to them. And a huge part of their brain is dedicated simply to this one sense. So smelling is a very normal part of any dogs life so don't think the puppy is being bad for smelling it's surroundings - it's not being bad doing this any more so than you would be for looking at your own surroundings with your eyes. And German Shepherd puppies carry things in their mouths - they don't have hands - and the world is new to them so many things will go in their mouths - again, this is a learning process plus the dog is learning all about things by their taste, smell, etc. Just give the puppy plenty of his own toys to play with to fill it's need to teeth, carry, etc. Remember your puppy is just a baby and needs to learn and if you constantly take things away from it you're not teaching it anything - you're simply depriving it from important stimulation. Concerning the jumping I would highly suggest that you both get into a puppy training class asap! It's great for the puppy and will teach you how to work with your dog and begin to think more like a dog so that you'll better understand your dog. Good luck with your GSD puppy. Well, Rambo is now 3 years old. How time flies! He is my shadow, following me everywhere I go, my protector and my best friend. He is also very smart. When I talk to him, he looks at me with those beautiful brown, human-like eyes and listens attentively at what I say. We spend a lot of time together. I hug him and pet him a lot and he gives me loving kisses. My rambunctious little puppy grew up into an amazing dog. Better you first understand how dogs minds work first and it would help you immensely. Try watching Cesar Millan videos or any other trainer. Also teach your dog how to leave things that are in his mouth. You can easily learn this vital order from youtube. It takes about minimum 20 mins to 2 hours. P.S. I adore that picture of him as a young puppy. He grew so fast and he turned into a very handsome dog, but I love looking at pictures of him when he was little. So cute! I have two puppies - about 5 mo old now - ears periodically go up but don't stay long. They will get up there eventually. My AKC 11-year old has one soft ear but I never cared. She is training the puppies so well...she helps with walks.. one puppy, the male, is headstrong like yours. I use a small claw collar and he walks beautifully - like having a steering wheel.. never pull on it though - he's too little, but he walks like a soldier at my side with that on. My GSD is now 7 months old. I went on a personal business trip a month ago when he was 6 moonths old. His ears were still down when I left. Now his ears are up and he grew a lot. He is so handsome with his ears up! when walking your gsd the leash should be short and also loose when walking .if the leash is taught then he will want to pull even more , i walk my gsd which is 6 mnths old everyday , he walks beside me like a champ and such a pleasure to walk ,, we walk at least 3 miles or more per day , its the best thing you can do for your dog . keep up the good work , you will find that your gsd will be a great dog and true companion . Rambo is now 5 months old and he is behaving much better. He also grew a lot. He is very playful, which probably caused his hygroma on his right elbow. It had to be drained twice and now he is fine. He was also diagnosed with some hip dysplesia. Therefore, the vet changed his diet from puppy food to adult food. He said that the puppy food makes him grow too fast, which is the cause of his dysplesia. He is doing great though. The only complaint I have is that his ears have still not gone up. But they have been up for short periods and once even for a day. It seems that if a GSD's ears have been up even for short periods of time, they will eventually go up. So I am waiting. I refuse to tape or glue his ears, no matter what. Thank you for your reply. My Rambo is now 4 months old and he behaves much better. At somebody's suggestion, I bought him a training collar. I am now enjoying walking him. He is like a walking buddy to me. I can't wait to come home from work to take Rambo on a nice walk. We also let him run free in our backyard. He plays with balls and runs around a lot. He has a lot of toys in his crate: teething toys, two stuffed animals, balls. He loves to play with them.